In pursuit of Ireland is just another way of saying that the Royal family has been in pursuit of their Irish ancestry for a very long time. The family historian (genealogist) is looking for what they call the pot of gold at the end of the rainbow. Which is essentially the exact spot your ancestor left his home in the mother country -in our case Ireland- to emigrate to another country. Thus in turn the migration routes that led to you being in the exact spot you currently live. Why and how the bulk of the Royal Clan ended up in Washington State is our story here. On the website- The Stump Ranch- I've waited on sharing anything on Thomas Edward Royal and his Irish roots. He has been neglected intentionally. Not for lack of affection for his life. Not to ignore that he was the father of Mabels Brood. Not that he didn't leave his mark, or give something of value to his children. I simply wanted to wait until I could find something with more substance to share with his children and his descendants. I believe we've got a good start here and there is more to come. Tom taught his wife and children outdoor skills, survival skills, woodsmanship and everything he knew about logging, (including horselogging from the early days of logging). These skills were extremely valuable during the hardest times, especially during the depression of the 1930's. 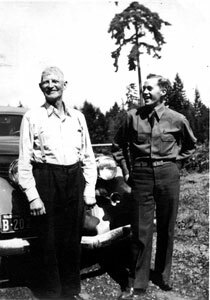 These skills were extremely valuable to his sons Tom and Howard who became magnificent loggers in their own right during the peak of the logging industry in Skagit County and Washington State. And though he became increasingly delinquent (working and lodging at logging camps) as a father and husband, as the children grew older- causing the dissolution of his marriage to Mabel- his children still looked up to and respected the man. He is my great grandfather; I needed to get to know him better and my Irish ancestry. After several years of piecing together the very few clues about his life by interviewing his living children- my grandfather Howard Royal, Jack and Betty Royal, George and Shirley (Royal) McLain plus Thomas Owen Royals widow Orlie (Cook) Royal, things came together this year to accomplish just that. Finding the ancestry of Tom Royal has been difficult. So this is a long time coming for the Royal family- specifically the family and descendants of Thomas Edward and Mabel (Boyd) Royal. It has not been for a lack of trying, as I know cousin Dorene Royal Kartes has made valiant efforts in the past. Tom Royals early years with his family in Wisconsin were always a bit of an enigma. For whatever reasons, Tom Royal left very few clues about his family. When he and Mabel Florence Boyd married 14 November 1907 in Locke, Stevens County Washington [separating into Pend Oreille County 12 June 1911] Tom listed his parents as Owen Royal, father born in New Brunswick, Canada and Jane Ryan born in New Brunswick, Canada- the marriage certificate shows Tom being born in Oshkosh, Wisconsin. Mabel had just turned the age of 16 the day before her marriage and had been living with her sister Maud, brother in-law John Johnson and family for quite a while, following an unsuccessful few years with her father Alex and step mother Mary Lou in Tacoma, Washington. The Johnson family had been in the Parker Lake area since 1901. Tom was twenty years Mabels senior at age 36 and had a homestead close to the Johnson family. Metzger maps put the homestead on Cusick Creek just west of the Silver King Mine near what is known as the Parker Lake area. The closest towns were Locke and Usk. We know that Tom left home at an early age because he did not care for the Irish Catholic Church. This was also one of the reasons Mabels father Lewis Alexander Boyd gave for having left home early and stowed away on a ship. The Catholic Church being a source of irritation for the both of them makes me curious if Tom and his father in-law discussed the subject. We do know now that Thomas Edward Royal was born in a small town called Cicero, in Outagamie County Wisconsin 22 June 1871 (according to his death certificate). The birth year could possibly be 1870 as the 1880 U. S. Census for the town of Cicero shows Tom at age 9 on 3rd June 1880 with his birthday not far away. Whether or not the enumerator of the census put Tom's age at his upcoming birthday is not known, but I believe enumerators were required to list the age of a person at their current age, regardless of how close a birthday was. The Barnard Ryal family (Tom's grandfather) came from Ireland to New Brunswick through a port on the Miramichi Bay [off the Gulf of St. Lawrence] June of 1830. Mabel Boyd Royal felt confident that her husband's ancestors came from county Cork in southern Ireland. From what I can make out in my research so far from the International Genealogical Index at my local Family History Center, the majority of RYAL/RYALL names come from county Kerry and county Cork. Barnard Ryal and family ended up in the Parish of Newcastle - Lower District Northumberland County, New Brunswick. Barnard first appears in the local tax returns from the county assessors in 1830. By the 1835 tax return the last name of Ryal had the letter 'O' added to the spelling by the enumerator? Thus our name changes with the spelling of RYAL to ROYAL. Currently I'm not aware of whether or not Barnard's wife was still alive or had come from Ireland with the family (hopefully I will find something at a later date) as no name has been recorded in any Northumberland County records I can find. Barnard would have been approximately 48 years of age when he and his four children came to New Brunswick in 1830. "It was time to go." We were peasant farmers in Ireland. Nothing to be ashamed of as the farming tradition has been continuous from Barnard to Owen to his grandson Thomas Owen Royal, his children to present day where my cousin John Jonasson and his wife Teresa still work with livestock on the original Royal Stump Ranch in Birdsview and grow much of their own food. Appalling poverty and frequent potato crop failures made life miserable in windowless dwellings made of stone and mud. The worst was yet to come starting in 1845 which became known as the "Great Potato Famine" and lasted several years killing thousands. According to the tax return mentioned above Barnard had only 5 pounds [listed in Poor Rates] left to his name when he got to the New World in New Brunswick. "The sharp reduction in passenger fares on timber ships returning to British North America about 1830, from five pounds per person to as low as one pound, made possible the first mass emigration of the Irish and mainly Catholic poor." (Ireland to North America by Joseph A. King; K&K Publications 1994) According to Joseph Kings book the trip from Ireland to Newcastle took six weeks on a sailing ship, with "crying among the women." The "Land of Happy Retreat" as the Micmac natives called Miramichi was because of the good hunting and fishing. The Ryal family just missed grants of free land that ended the year before. Shipbuilding was a major industry in the close towns of Newcastle and Chatham. Because the earlier settlers had the best lots close to the river, the newer families coming here by 1830 went farther inland in areas known as "Irish settlements." The Royal family has always recorded Owen Royal, to be born in New Brunswick around 1830. In all likelihood he was born between 1826 to 1829 in Ireland and came to New Brunswick as a baby or young child. Owen and his sibling are recorded in school returns only twice. The first time in December 1839 where young Owen is recorded at age 13 with a sister Catherine the same age [making these two born in 1826]. A sister Bridgett is recorded at age sixteen. Chances are the children didn't get much schooling as they all had to work the farm to provide for each other. But education was important to the area Irish families. I found them next recorded in school returns in November of 1842 with the teacher making odd changes in age? Owen is recorded at age 14, putting his birth year at 1828 and sister Bridgett the same age as he, which makes it confusing as who the twin was, Catherine [recorded age 15] or Bridgett? One older brother is listed - and this is a fun item- age 18. His name is Thomas, a name handed down the Royal line ever since. In the 1843 tax return we find Barnard and Thomas Ryal listed together. Barnards real estate is worth '50' pounds with no annual income. Thomas seems to be providing for the family with an annual income of '20' pounds. In March of 1996 I had hired a certified genealogist by the name of Daniel F. Johnson to look for any ROYAL surnames in New Brunswick. The only name at the time he had come up with was a death listing, in a local New Brunswick newspaper for Barnard Royal, 19 September 1846 at the age of 64. [Making his birth year approximately 1782 in IRELAND] I had dismissed it at the time and filed it away until I started getting more serious with my research on my ROYAL family lineage this year. Obviously, the find was a good one and this is the last record of Owens's father. My next goals will be to track the family in Ireland itself and more than likely will have to pursue Catholic records to find them. Owens's Emigration to the U.S.
At the time of Barnard's death in 1846 the sisters, Catherine and Bridgett, could very well be married and I have no further records of them yet. No record of Thomas being in the area also by the year 1851 when Owen J. Royal is recorded in the 1851 census returns at age 23 as a border on his own, his occupation listed as a laborer and of Irish nationality. Here is where our date was found for when the Barnard Royal family entered the colony, June 1830. This is a great find for any family historian looking for that information. The only other ROYAL surname in the area close to Owen is a Helen Royal listed close by at age 25 of Irish nationality and a servant in a household. Whether or not this is sister Catherine or Bridgett using a different name is unknown at this time. The only other possibility would be a first wife of Owen? The Barnard Royal family was the only surname listed in Northumberland County during this time period. Catherine Jane Ryan was born in New Brunswick approximately 1836-1841, presumably in the Northumberland County to parents both born in Ireland. I've found several RYAN families listed in different returns close to the ROYAL'S. Two Catherine's in two large RYAN families close to the same age make it difficult to tell which is the right family. I'm going under the assumption currently that Owen and Catherine married in Northumberland County and immigrated to Wisconsin by 1867. The Irish coming into the United States from New Brunswick came into states such as Minnesota and Wisconsin as logging was becoming a big industry and the Irish seemed to take to logging the old growth forests. Owen and Jane ended up in a town called Cicero [which had been the north half of Black Creek], in Outagamie County - they continued as farmers. It doesn't appear they knew or understood the Homestead laws as I could find no land patents with the Bureau of Land Management. Thomas Edward Royal was born in Cicero as was his sister Alice A. Royal in 1876. There is recorded from a 1900 Census Return a third child born but not living, whether dying in childbirth or at an early age is not known. We know that the area was cold enough in the winters that the lakes and rivers would freeze over enough for the children to skate on. The closest river was called Shioc. As I've mentioned above, Tom left home at an early age due to his dislike for the Catholic Church. His grandchildren Bob & Dorene remember their grandfather Tom saying his family had expected him to go into the priesthood. Needless to say he wouldn't have anything to do with that. It didn't appear to his wife Mabel or children that he had any contact with his family in Wisconsin. Whatever caused the separation with his family; the church definitely played a definitive role in his walking away from his family by his teens. Owen Royal died or was buried 4 October 1893 at St. Mary Cemetery, Outagamie County Wisconsin, in the town of Black Creek. His age is listed at 62 years of age but this could have been off by five years at least. Catherine was not a widow for too long as nearly a year later she married a neighbor by the name of James McKendy, also of Irish origins. [Other spellings McKundy, McKendry] This was 4 August 1894 and in the 1895 state census returns James is listed with two females in the household (names not listed but they would be Catherine and Alice). I don't imagine remarrying like this was uncommon for widows, as a woman of the times probably needed a man to provide companionship and sustenance. James McKendy appeared to be five years Catherine's junior and by the U.S. Census Returns for 1900 they are living in the city of Oshkosh 13th Ward, Winnebago County with Toms sister Alice still living at home.